I’m searching for a ghost and the Pisgah State Park is a good place to go looking for one. There are over 21 square miles of nothing in Pisgah, located in the southwestern corner of New Hampshire. There are seven remote ponds, four highland ridges, steep ravines, rock outcrops, numerous wetlands and pockets of old-growth forests. Except for trail signs, there are almost no manmade structures anywhere within this 13,300-acre park. But it wasn’t always this way. A massive stone dam and some old graveyards give hints to the life that existed here once. Pisgah was a place of thriving lumber camps, sawmills, box factories, boarding houses, a blacksmith shop, family farms, villages and a schoolhouse. There were also primitive hunting and fishing camps erected on the ponds with little or no landowner permission. In 1885, there were eight sawmills and four box shops producing wooden boxes and demanding raw logs for boards. There was also a tannery that used the tannic acid from the bark of hemlocks in the process of curing hides into leather. In 1880, much of what is now the western side of the park was owned by the Dickinson Real Estate & Logging Company. Dickinson practiced sustainable logging and avoided cutting all of the old-growth forest trees. The general inaccessibility of the area also helped protect this old-growth timber. In 1889, Dickinson merged with two other companies to form New England Box Company, the largest manufacturer of wooden boxes in North America. NEBOX Co. continued to manage the forest to protect the old-growth trees and some areas were never completely logged away. Making box boards when everything shipped in wooden crates was profitable, but starting in the 1950s, with the advance of cardboard, the demand for wooden shipping boxes declined, and eventually the box factories and sawmills closed. 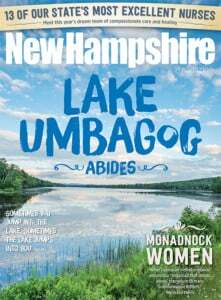 The structures remained up until the 1960s when the State of New Hampshire, with the grand plan of creating the Pisgah State Park, began buying out landowners, evicting camp holders, and taking the land by eminent domain from holdouts who refused to sell. August 10 1931, William Milke, 61 is charged with the murder of Mrs. Eldora Collins, 49. Milke and Mrs. Collins were partners in the Dickson Lumber Company camp on Pisgah. Jealousy is reported to have been the cause of the crime. Milke and Mrs. Collins had an argument and Milke secured a double-barrel shotgun and fired at Mrs. Collins and then secured a razor and slashed his own throat. Another incident, or perhaps the same one after being retold too many times, tells of a guy named Maddock who went after a guy named Davis with an ax, fighting over a woman. Davis got a shotgun and killed Maddock. On December 30, 1891, John P. Hill, of Winchester, accompanied two of his young children on a skating expedition to Lilly Pond. A nephew of Mr. Hill, Lafayette Sprague, went with them for the purpose of angling through the ice. Lily Pond lies partly in Winchester and partly in Chesterfield and was thought to be sufficiently frozen to be safe. Mr. Sprague broke through the ice. Mr. Hill was on the shore and upon seeing his nephew’s danger seized a board and rushed to the rescue. While still three rods from the struggling man, the ice gave way beneath him and Hill was also precipitated into the water. Lafayette Sprague was a veteran of the Civil War and hikers have reported seeing a man in a blue G.A.R. Union uniform fishing from the opposite shore of Lilly Pond. Vincent Dubriske is another restless spirit said to still travel the Pisgah hills. He had a cabin on a peninsula and was evicted in 1972. Dubriske is said to have visited the park daily until he died in 1976. He was known to collect ginseng roots to sell and used to carve his initials on beech and birch trees all over the park. Some of these marked trees remain. But I’m not searching for the spirit of some deceased person. I’m looking for the ghost of a long-gone building. And “building” may be too generous a word for the rustic camp that I’m hunting for. The camp was torn down sometime prior to 1972 and I never saw it. Nor do I know where it stood. I do know that it was located on the shore of a pond somewhere in the Pisgah wilderness. A couple of old black-and-white photos taken in the early 1950s and faded family stories are all I have to go on to find it. The camp building I’m looking for was purchased in 1943 by my grandfather and sold in 1954 to the Hinsdale town barber. There was no road access to the camp so you had to boat across the pond to get to it. Grandfather had a farm tractor that could get part way in to the camp by slithering through the woods for miles on old logging skid trails, but only when the ground conditions were favorable. Because these camps were little more than tolerated squatters on lumber company land, there is no deed description to help me find where the camp once stood. Old family stories and some 1960s documents from a thin state archive file narrow the search down a little. The paper trail indicates that by the late 1960s, the state had forced the town barber to sell what had once been my family’s camp and had then burned it down to comply with the state’s vision of a no-man-made-structures wilderness park. Rocks along the shore in the old scrapbook photo seem distinguishable enough, but on the ground they all looked identical. I tramped along the shore for hours and miles, through dense underbrush and poison ivy, looking for remnants of the long-gone tarpaper shack or perhaps shoreline rocks that matched the ones in the photo. I knew the chances of finding it were slim, but at least I’d be getting exercise and feeding the mosquitoes. The family camp, torn down in 1972, is shown still standing in this photo from the 1950s. After a full day of searching the shorelines, I was about to call it a day when I came upon a rock that looked like a possibility. I started knocking back the jungle of growth in the area and uncovered some rusted kerosene drums. Poking around more, I kicked the forest duff off of some old glass bottles, some bricks, and then an iron bed frame and spider frypan. A few feet away I found the door from a kerosene stove. I’d found my ghost. In the middle of a 13,000-acre wilderness I’d discovered the site of my grandfather’s camp. I now stood where 70 or more years earlier he had fished and made coffee over an open campfire. With new pictures in my camera, old memories in my heart, and a recovered brick in my rucksack, I made the trek home. Next time I’ll pick lighter souvenirs.